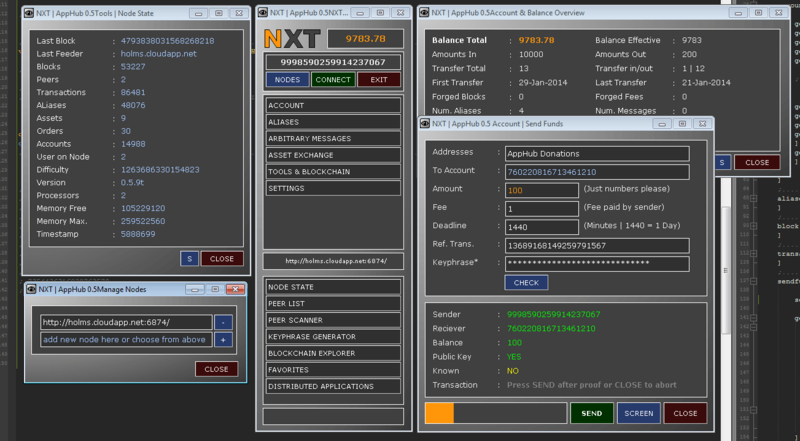 Waiting for the new Nxt wallets? Nxt community member Damelon will do a showcase of the upcoming Nxt Clients, over the next week. Damelon lives in the Netherlands. He has a local Nxt site (nxtcoins.nl) and has been blogging about Nxt since 03.01.2014. Most beloved are his daily Bitcointalk Summaries (in English) where he points out the most important highlights from the fast moving main Nxt-thread on Bitcointalk.org. A user-friendly Nxt Client is an important step if we want Nxt to get adopted by mainstream users. And right now, several Nxt clients are on their way to release. Nxt has reached more in this 65 days than any other crypto before. For the client I can tell you the same. Currently there are three desktop clients in work (hopefully I don’t forget one, many action here). Minusbalancer creates a one-in-all version running without server part, marcus03 writing a rich feature client including quoting, charting and more and I am writing a lean account centric version. Client dev is a serious matter, user funds are involved and therefore you can be sure, even with pressure, I don’t release something half just to satisfy your or any other quick demand and I am sure the other dev’s looking at this similar. 665kb / 406 kb zipped!.. even if i would add a complete chart engine for AE, the size wouldn’t pass 950kb for the executable (compared to other alt coins clients which are between 20-50 times larger by less functionality). The client is sdi based, means only the center hup starts folded, subcategories unfold on demand. all others windows can be arranged as desired. this saves screen space. Atm i am re-composing the gui to adding a native screenshot function to the client, means every important form (like send/balance etc.) has an screen button, dumping the whole dialog content into a clean rendered png image. The distributed application/smart contract logic took me 5 days which was planed for AE but i am simply eager to show the first real running protoype by nxt while others concepting. with release, a fully functional quoteboard DNA prototype will be included. During test, the remotely executed and sandboxed DNA sourcecode will be hosted on blockexplorer node but could be located everywhere. AM is used for payment and access signaling. not every workflow is solved for DNA, this needs a little more brainstorming but i am confident nxt will run the first one. Follow the Nxt Client Showcase on http://www.nxtcoins.nl/50-2/. You might also want to subscribe to his blog HERE to get the latest news from his hand. Until the release of the new clients, Nxters and newcomers will have to stick with the NRS (Nxt Reference Software) browser Client. You can read here, how it all works.